The ENO’s production of Parsifal, which opened last night, is a revival of their 1999 staging, directed by Nikolaus Lehnhoff and conducted by Mark Wigglesworth. This is Wigglesworth’s first Parsifal, and he’s made a triumphant start. The fifteen minute prelude was like listening to a symphony all by itself, and I was grabbed from the very first note. For the whole evening, the orchestra gave a wonderful account of Wagner’s complex variety of textures and harmonies. Simple string lines and vocal chorales shone through with clarity, while Wagner’s brass-laden passages were stirring or authoritative as the occasion demanded, almost always perfectly balanced to the level of the voices. 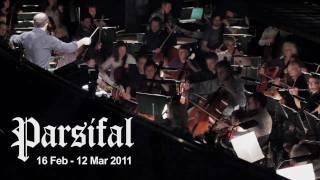 Parsifal was Wagner’s last opera and is a work that can be read on many levels. At its simplest, it’s a good old-fashioned Arthurian legend: knights of the grail, an evil sorcerer, a beautiful enchantress, a pure knight wandering the world on his quest. One level of abstraction up, it’s a study in the nature of suffering and man’s empathy for the suffering of his fellows, with the associated religious theme of Christ the Redeemer. The opera also explores the gap between Western and Oriental philosophies: Wagner had been reading about Buddhism during the opera’s conception. You can find philosophical musing on the nature of mortality and the human condition, or, if you wish, unpleasant ideas of racial purity and the survival of the master race. But above all else, Parsifal is a phenomenal piece of music. In The Roots of Tragedy Friedrich Nietzsche, a great friend of Wagner’s before they fell out, explained one of Wagner’s guiding principles, that there is a level at which music communicates with the brain directly in a way which cannot be expressed in words. Whether or not you are grabbed by the characterisation or story-telling in Wagner’s libretto, the music moves and stirs you in precisely that non-verbal way that Nietzsche describes. That’s particularly the case when the performance is up to the quality that the ENO treated us to, with two performances that blew the roof off the house. John Tomlinson is one of the world’s great Wagnerian basses, and he was quite magnificent as the elderly knight Gurnemanz. His voice is rich and resonant, his diction remarkably clear (it’s the first time he has sung the role in English, which apparently took some serious hard work) and his overall performance captivating. In the title role, Stuart Skelton just about matched him. It’s a classic “heldentenor” role, requiring a heroic voice with strength and richness; as the opera progressed, Skelton increased the power and authority in his voice just as the power of the character Parsifal grows. In the scene in Act III in which Parsifal takes control of proceedings and heals the ailing King Amfortas, he was simply sensational. As the enigmatic and multi-faceted heroine Kundry, mezzo-soprano Jane Dutton may not quite have reached the same heights as the two male stars, but it was still a fine piece of singing and acting, particularly her powerful telling of Kundry’s accursed predicament in Act II. Iain Paterson impressed as the anguished King Amfortas. Generally, I liked the staging. Costumes evoked a mediaeval aesthetic without attempting to dress everyone in replica suits of armour; colour schemes and lighting showed the faded powers of the Grail knights as the lapse into greyness, the East-West struggle was represented by oriental-style armour of the evil magician Klingsor. While the setting was generally effective, there was the occasional misfire, to my mind: the Act II scene in which Kundry and the flower maidens attempt to seduce Parsifal was as dull and monochrome as everything else, whereas that part of the opera surely requires a bit of brightness and sensuality to contrast with the asceticism of the Grail kingdom. Like most Wagner operas, Parsifal is very long: it’s a five and a half hour evening, with over four hours of music. But the time flew past: my attention hardly wavered. Wigglesworth and the orchestra received a bravo-laden ovation as they settled into the pit for the start of Act III, and the applause at the curtain calls was rapturous. It’s a privilege to have seen Tomlinson in this role, and it may be a long time before I hear better bass singing or a better overall orchestral performance. Miraculously this was Mark Wigglesworth’s first Parsifal, and the pregnant pauses were as masterfully calculated as the stupendous climaxes. I find it almost impossible to believe that Mark Wigglesworth has never conducted Parsifal before – in this revival of Nikolaus Lehnhoff’s 1999 production, it sounded as though he’d been soaked in the score all his life and thought of nothing else. Miraculously, he struck the fine balance between the music’s unique translucency (Debussy said it was ‘lit from behind’) and its depth, weight and intensity. Each act was confidently shaped through one organically growing curve, within which the whispered pianissimi, the shimmering stillnesses and the dramatically pregnant pauses were as masterfully calculated as the stupendous climaxes. The orchestra was inspired to playing of a smoothness and security which would not have disgraced the Berlin Phil. To ENO’s Wagnerian pantheon, occupied only by Reginald Goodall and Mark Elder, the name of Mark Wigglesworth must now be added. The only problem was that the warmth and eloquence emanating from the pit seemed in contradiction to the aridity of what was on stage. As rehearsed by Daniel Dooner, Lehnhoff’s vision of Wagner’s last testament – admittedly, a supremely ambiguous work – remains powerful, but essentially joyless and nay-saying, as well as brutally ugly. Raimund Bauer’s setting is a concrete bunker, after the bombs have fallen. Beckettian endgames are evoked by the desolation, though the costuming suggests samurai and the Terracotta Army. Most strikingly of all, the final act shows a single railway line leading into a dark tunnel. For Lehnhoff, Wagner’s mystical racism has only one destination: Auschwitz. With all religious iconography eliminated, there is no redemption or salvation here. The natural world which springs so gloriously to new life in the orchestra and in the eyes of Gurnemanz remains hopelessly dead. This is not my reading of Wagner’s intention. Stuart Skelton, made up to resemble something from Planet of the Apes, made a sterling but somewhat pedestrian Parsifal – the more inflected, lustrous, and impassioned singing came from Iain Paterson’s Amfortas. Jane Dutton tried her damnedest as Kundry, but was defeated by the cruel demands of the second half of Act 2. The chorus sounded magnificent throughout. Dominating the stage, however, by sheer vividness of personality, was John Tomlinson’s Gurnemanz. Singing the role in English for the first time, in excellent voice (no barking or honking), he movingly communicated a sense of the passive agony of waiting and watching, guarding and protecting, which gave the production its one truly human face. Since it was created at the Coliseum in 1999, Nikolaus Lehnhoff’s staging of Wagner’s final opera has been seen across Europe and the US, but it has not been revived by English National Opera until now. The production has inevitably evolved over those 12 years, and the version of Parsifal that has returned to London differs in some details from what was seen here before. What has remained intact, though, is the remarkable power and conviction of Lehnhoff’s treatment, and its disturbing post-industrial, post-religious world. The visual landscape this Parsifal inhabits is purged of all Christian references. The text, of course, remains stuffed with them: redemption, holy blood, guilt, sin and suffering. But the power of ritual that is depicted on stage, and which sustains this raggle-taggle crowd of grail knights in dusty fatigues, is blissfully much less specific. Lehnhoff subverts the ending, too: Parsifal does not assume leadership of the knights, as Wagner indicates, but instead leaves them to it, walking away with Kundry along the railway line that leads into a dark, uncertain future, an endgame without an end. As before, too, the dramatic power of the production – with sets by Raimund Bauer and costumes by Andrea Schmidt-Futterer – is matched in the music. Mark Wigglesworth’s conducting is wonderfully poised, timelessly spacious in the outer acts. If he is less unbuttoned than he might be in the second act, then the production also seems less sharply focused there: despite their testicle-like hairpieces, Lehnhoff’s Flowermaidens are a pretty frumpy bunch, and the carapace-like layers that Jane Dutton’s Kundry has to moult before she can get down to seducing Parsifal don’t help the party go with a swing, either. Dutton is a replacement for Iréne Theorin, who was originally cast as Kundry; her one-dimensional vocal performance is the only weak link in an otherwise superb lineup, in which the standard is set by John Tomlinson as Gurnemanz, with diction and projection that make surtitles superfluous. Iain Paterson’s Amfortas is almost equally fine, depicting the cringing, broken king of this production with touching vividness. Stuart Skelton is Parsifal, not always moving around the stage as convincingly as he might (though the heavy black armour he wears in the last act hardly helps), but with a voice of authentic Heldentenor scope, in a staging that is as good as any Wagner seen in London in the last 20 years. The English National Opera introduced the German director Nikolaus Lehnhoff’s production of Wagner’s “Parsifal” in 1999, and since then this influential modern staging, which presents the Knights of the Grail as a spiritually decaying brotherhood in a bleakly gray, postapocalyptic and timeless setting, has traveled far. It was presented by the San Francisco Opera and the Lyric Opera of Chicago, the staging’s co-producers; it played the Baden-Baden Festival in Germany in 2004, where it was filmed for a DVD release; and it had a run at the Gran Teatre del Liceu in Barcelona. On Wednesday night it returned to the English National Opera for one more run. An enthusiastic audience, with encouraging numbers of young people, nearly filled the beautifully restored, 2,360-seat London Coliseum, which opened in 1904 as a people’s palace of entertainment. The accomplished British conductor Mark Wigglesworth, in his first performance of “Parsifal,” drew warm, plush and sensitive playing from the orchestra; the heroic Australian tenor Stuart Skelton was compelling in the title role. Best of all was the veteran British bass John Tomlinson, magnificent as the earnest knight Gurnemanz, who seems to take on personally the doubts and pains of his ailing leader Amfortas. I was eager for the chance to hear Wagner’s German libretto performed in the excellent English translation by Richard Stokes. Central to the mission of this company is a commitment to presenting opera in the language of the audience, a practice debunked in some opera circles as a violation of original intent. Of course it involves a tradeoff: vocal lines were carefully fitted by composers to the specific language of a libretto. But opera is theater. And for theater to work audiences must understand the words being sung (or spoken) in the moment. Wagner would have thought it strange not to translate “Parsifal” into English for an audience in London. Many argue that supertitles provide the best solution: you hear the original words but are provided simultaneous translations. But titles are distracting. For me, the impact of hearing “Parsifal” in English came with the first lines sung by Mr. Tomlinson as Gurnemanz in the opening scene just after the sublime orchestral prelude. The old knight sees two young squires who are supposed to be guarding the sanctuary of the Holy Grail but are fast asleep. “Hey! You! Guards of the woods! Rouse yourselves from slumber,” Mr. Tomlinson sang. Annoyed, he added, “At least wake up when it’s morning.” Soon, he recounts the story of Amfortas, who had set off to destroy the evil Klingsor. When denied admission to the chaste brotherhood, Klingsor turned to sorcery and transformed a barren desert into a pleasure grove with beautiful women to seduce the knights. For English-speaking audiences, to hear Mr. Tomlinson’s Gurnemanz relate this tale in vividly descriptive English made what can seem like narrative filler when “Parsifal” is performed in German into an episode of engrossing musical drama. Mr. Tomlinson, a renowned Wagnerian, always makes words matter. At 64, he seems at the top of his form. His singing was excitingly stentorian and powerful. And when he sings in German his diction is just as crisp and direct, as audiences in New York know from his performances at the Metropolitan Opera, including his Gurnemanz during a “Parsifal” run in 2001. Not every singer here had diction as admirably clear. Some years back the English National Opera started using projected English titles for all its performances (as the Met does). This move was seen by some as a compromise to the company’s mission and by others as a sensible step to aid the comprehension of audiences. I mostly go with those who think it’s sensible. As Parsifal, the clueless young man who chances upon the knights and comes to understand that he is the innocent fool prophesied as their savior, Mr. Skelton sang with ample sound, burnished colorings and comprehensible diction. The mezzo-soprano Jane Dutton brought a dark-hued, vibrant voice and volatile intensity to the role of Kundry, the mysterious wild woman pressed by Klingsor into ensnaring the knights, yet inwardly aching for redemption. The sturdy bass-baritone Iain Paterson was a poignantly anguished Amfortas; the baritone Tom Fox a vocally sneering and wily Klingsor. The immediacy of experiencing “Parsifal” in English enhanced every element of this admirable performance and intriguing production. In a fine cast for the first night of this revival of Nikolaus Lehnhoff’s production of Parsifal (a production first seen here in 1999), there was really only one star. John Tomlinson’s Gurnemanz dominated the Coliseum. With the ENO orchestra in fine fettle (some occasional ragged wind and brass chords aside), this made for a memorable evening. There were some major players on the stage – that Tomlinson emerged so strongly is testament to the huge experience he brings to the part. Remember, he sang 18 consecutive seasons at Bayreuth (from 1988). He knows how to spin a tale – and Gurnemanz is Master Narrator bar none. Not a single hint of longeur here. If, in Wagner’s vision, time and space become one (Transformation Music), there is another element to time: Wagner shatters its illusion with the aid of a fine interpreter. Half hours, hours speed away as the listener loses all conception of time’s processional. Tomlinson alone achieved this, ably aided by Wigglesworth. Parsifal is there to achieve enlightenment and light all around him, but at the beginning of the piece Gurnemanz is the most enlightened of all on stage, able to chronicle and explore, if not explain, history. And even he does not recognise Parsifal as redeemer at first (he rejects him at the end of the first act). Tomlinson’s hopeful moments, underscored by Wagner’s luminous scoring, are magnificent. The moment he greets the spear (Act I) was simply transcendent. Lehnhoff’s vision is bleak. Uncompromisingly so. In the booklet notes to the Opus Arte issue of his production (there with Kent Nagano in the driving seat: OA 0915 D), Lehnhoff refers to Wagner’s music telling us “mercilessly… of total loneliness”; here is a world where “everyone is an outsider”, an “empty world stripped of its former meaning”, where “lost souls wander aimlessly through time and space”. The setting is truly surreal. A boulder (I’ve heard it suggested a fallen comet) juts out into the stage, later to revolve and disassociate itself with its surroundings. The set for act one is relentlessly grey; the costumes for Gurnemanz and the Squires match and accentuate the prevailing oppression. The Squires actually seemed to be animated (or at least semi-animated) terractotta figures. Amfortas still holds out hope (“Durch Mitleid wissend” – Enlightened through compassion, he repeats) yet the major rituals of this piece have lost their spiritual depth (is Lehnhoff making a sideswipe at the rituals as they stand of churches the world over? – I hope so). The stage is deliberately vague as to place – this is an alternative netherworld set somewhere in the multiverse, maybe on a parallel earth with a different evolutionary history. The oppressive staging emphasises the hope in Wagner’s Leitmotifs, and, indeed, their inner glow, the inner spirituality of the very music itself. The upward slope with its scattered chairs threatens our ability to perspectivise our surroundings; the men (chorus) that enter prior to Titurel turn to each other and hold each other in some sort of quasi-Masonic position; Titurel himself is a living, glowing, grotesque semi-skeleton. The spear (Longinus’?) and Grail are holy elements here. They remain unassailable in their holiness (the Grail is manifested by pure white light, the archetypal symbol of Spirit, emanating from a central strip in the stage), but the rituals themselves we see are shorn of their magic. Kundry, the wild woman who acts as Grail/Klingsor go-between, attains enlightenment through the intervention of a pure spirit, Parsifal. It is important to show Parsifal as innocent and arrogant – not stupid, and in this Stuart Skelton succeeded magnificently. As an innocent, he sees the world as revolving around him, just as a child does. The staging of the ritual at the end of Act I sets the participants in a symmetric shape. It is Parsifal, the outsider, who wanders around them, curious as to what’s going on. More, he symbolically upsets their tradition, both contradicting it and intertwining with it simultaneously. Uncomprehending he may be at this stage, but his dramatic function is without doubt. As Kundry, Jane Dutton (who sang Amneris for ENO in 2007 and Santuzza in 2008) impressed by her spot-on pitching. Her sound is slightly edgy, perfect for the part, and she portrayed Kundry as mysterious, defensive yet vulnerable. No wonder the squires taunt her. Dutton had the full range the part requires, which stood her in perfect stead in the Herzeleide Narrative (special mention for Wigglesworth here, whose hushed pianissimi and perfectly timed lead-in were the stuff of gold). Her top level is wonderfully free, her lower register fully developed. Stage-wise, she begins behind a static costume before systematically shedding her layers (at one point it is like she emerges from a chrysalis). Lehnhoff’s take on Kundry’s multiple incarnations mentioned mentioned in the text (by Klingsor), I suppose. Dutton delivered the magical line “Gelobter Held” (here, “O noble lord”) beautifully. Wigglesworth paced Kundry’s description of seeing Chist on the cross (“I saw him … and … laughed”) superbly; Dutton negotiated the huge interval on “laughed” perfectly. Skelton’s Parsifal rose to the challenge of the long exchanges, his voice seeming to get stronger as the act progressed. Andrew Greenan was a spooky Titurel, whose last breaths of authority (with an amazing depth and character of sound) were heart-wrenching. He in fact overshadowed the Amfortas, Iain Paterson. Amfortas’ cries of “Have mercy” were not fully convincing, and Paterson did not hold the stage in the same way as his colleagues did. Tom Fox, who sang Klingsor in the DVD mentioned above, was superb, a true embodiment of evil in the form of a “fallen angel”. He had all the requisite power the role demands, and more to spare. His appearance, in a somewhat insectile costume set inside a huge human skeleton (the pelvic area) was awe-inspiring. His Flower Maidens were seductive in a slightly nightmarish way, their arms extended by their costumes stamens. As a chorus, they made a huge sound where appropriate, and Wigglesworth’s pace enabled them to waft seductively in the breeze. The Squires, the true voices of the unenlightened in Parsifal, were ably sung. The chorus was its normal imposing, impressive self. The translation used was rather clunky and awkward. Wagner’s transcendent music triumphed over even this adversity, of course, but it is time for an overhaul. Holding it all together was Mark Wigglesworth. His affinity for Wagner was evident in the Prelude to Act I – specifically, the way the silences were held. These silences are, as in the music of Webern, an integral part of the music itself. Motifs reached through them, resonating in the listener’s consciousness. The brass excelled (the so-called “Dresden Amen” rivalled anything that could be done across the way at the Garden). Wigglesworth let dissonances dwell. No mere voice-leading on the way to consonant arrival points, Wigglesworth was more than aware of the significance of held dissonant simultaneities in Act 1 – something that Wagner explores more fully in the second act (particularly at the moment of the Kiss). The holy aspect of Parsifal lies within the music, and even in the music’s spaces. Wigglesworth ensured the essential role of silence was intact. On the other side of the coin, the opening of the second act seemed to be a distant echo of the storms of Walküre Act 1, yet they were obviously intelligently balanced orchestrationally. He lacked the final levels of depth a Goodall could achieve, but this was impressive conducting nonetheless. This Parsifal remains a must-see. Worth noting also that the performance on March 8th will be recorded by BBC Radio 3 for “future transmission” (the programme was no more specific than that).